You will see a number of popular designs on this page to give you some idea of the range of exhibition display stands available, but we also offer a FREE 3D design service. 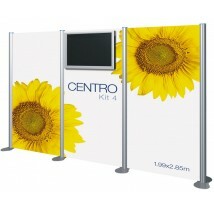 Centro is a versatile display system allows you to integrate display cabinets and slat walls into your trade show stand. It is also easy to incorporate storage or private marketing areas into the design with a locking door system. 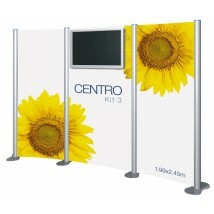 The Centro range is just a small part of our portable modular exhibition stand systems offering that can be used individually or combined to create your own configurations. 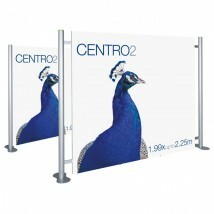 Ideal for events, exhibitions, retail and indoor promotions. 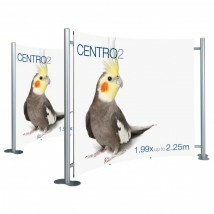 Choose from standard straight or curved displays or multimedia display systems. Centro has the added benefit of a range of integrating accessories which include slat walls for shelving and product displays as well as display cabinets and tables. You will see a number of popular design on this page to give you some ideas but we also offer a FREE 3D design service Innovative modular display system with stylish neon acrylic features and sturdy anodised aluminium construction. It has a unique twist and lock system making assembly and breakdown simple and quick. 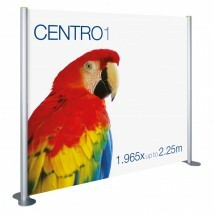 Straight panels are available in a choice of widths includes printed graphics and wheeled carry case. Comes complete with your guarantee. High quality modular graphic stand designed to hold LED screens. 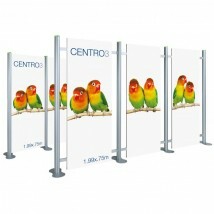 Graphic panels come complete with custom printed graphics that attach using magnetic tape. 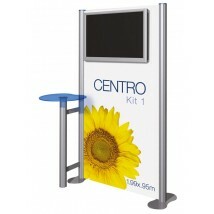 The stands are easy to assemble with a unique twist and lock fitting and come supplied with a podium table available in a choice of colours. 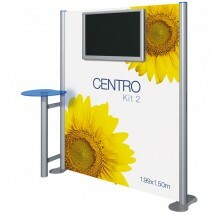 The universal bracket can hold screens from 32"-42" making a stunning AV display stand for your event or exhibition. All stands have a selection of accessories including counters, cases and lights.